It is a family tradition for us to have Buñuelos on New Year’s Eve to ring in the new year. I’m not sure when this started but as far back as I can remember, we have always had these on hand on this night. 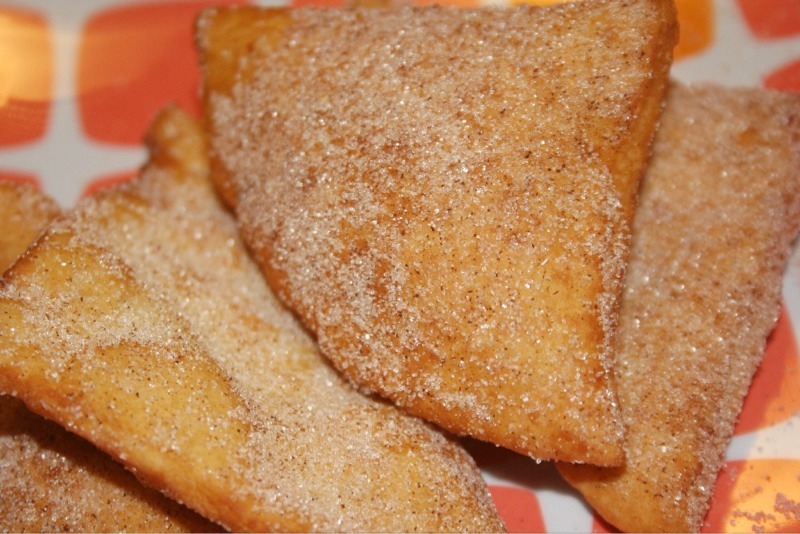 Buñuelos are similar to funnel cakes but the dough is lighter and instead of being covered in powdered sugar, they have a mix of sugar and cinnamon to top them off. One note of caution, you need to make sure your oil is hot enough and deep enough to fry them or else they will not fluff up enough. Preheat oil to 350-375 degrees F. In a large bowl, whisk together egg, milk and melted butter. Add flour, baking powder, salt and sugar; mix well. Knead gently until dough is smooth and elastic. Divide dough into 12 dough balls. Roll out to 6-inch circles. Cut dough in fourths. Fry in deep hot oil until lightly browned on both sides. Drain on paper towels. Mix sugar and cinnamon together. While dough is still warm, dip fried dough into sugar mixture and generously cover both sides.